What are some of the signs of climate change? • Temperatures are rising world-wide due to greenhouse gases trapping more heat in the atmosphere. • Droughts are becoming longer and more extreme around the world. • Tropical storms becoming more severe due to warmer ocean water temperatures. • As temperatures rise there is less snowpack in mountain ranges and polar areas and the snow melts faster. 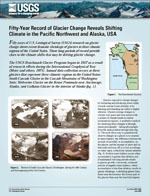 • Overall, glaciers are melting at a faster rate. • Sea ice in the Arctic Ocean around the North Pole is melting faster with the warmer temperatures. • Permafrost is melting, releasing methane, a powerful greenhouse gas, into the atmosphere. • Sea levels are rising, threatening coastal communities and estuarine ecosystems. What are the long-term effects of climate change? What is the difference between weather and climate change? Weather refers to short term atmospheric conditions while climate is the weather of a specific region averaged over a long period of time. Climate change refers to long-term changes. How can climate change affect natural disasters? Why is climate change happening and what are the causes? How do changes in climate and land use relate to one another? How do we know glaciers are shrinking? How does carbon get into the atmosphere? Atmospheric carbon dioxide comes from two primary sources—natural and human activities. Natural sources of carbon dioxide include most animals, which exhale carbon dioxide as a waste product. Human activities that lead to carbon dioxide emissions come primarily from energy production, including burning coal, oil, or natural gas. How much carbon dioxide does the United States and the World emit each year from energy sources? The U.S. Energy Information Administration estimates that in 2017, the United States emitted 5.1 billion metric tons of energy-related carbon dioxide , while the global emissions of energy-related carbon dioxide totaled 32.5 billion metric tons. Does an increase in the 100-year flood estimate originate from climate or land-use change? 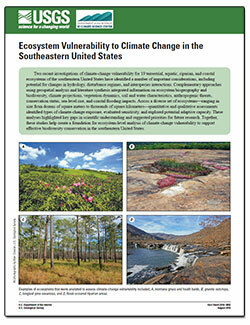 Cartwright, J.M., and Costanza, Jennifer, 2016, Ecosystem vulnerability to climate change in the southeastern United States: U.S. Geological Survey Fact Sheet 2016–3052, 4 p., http://dx.doi.org/10.3133/fs20163052. 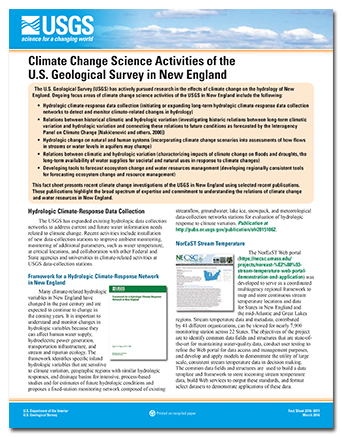 U.S. Geological Survey, 2016, Climate change science activities of the U.S. Geological Survey in New England: U.S. Geological Survey Fact Sheet 2016–3011, 4 p., http://dx.doi.org/10.3133/fs20163011. 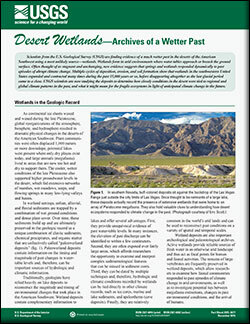 Pigati, Jeffery S.; Springer, Kathleen B.; Manker, Craig R.
Pigati, J.S., Springer, K.B., and Manker, C.R., 2015, Desert wetlands—Archives of a wetter past: U.S. Geological Survey Fact Sheet 2015–3077, 2 p., http://dx.doi.org/10.3133/fs20153077. Flint, Lorraine E.; Flint, Alan L.; Thorne, James H.
Flint, L.E., Flint, A.L., and Thorne, J.H., 2015, Climate change: evaluating your local and regional water resources: U.S. Geological Survey Fact Sheet 2014–3098, 6 p., http://dx.doi.org/10.3133/fs20143098. 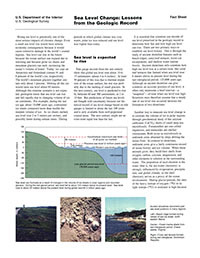 Climate variation and its effects on our land and water : Part A, Earth science in climate research; 1978; CIR; 776-A; edited by Smith, George I.
Habitat for the Pacific walrus in the Chukchi Sea is disappearing from beneath them as the warming climate melts away Arctic sea ice in the spring, forcing the large mammals to “haul out” of the ocean and temporarily live on land. 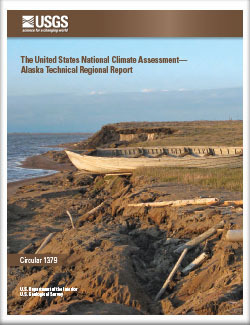 New USGS-led research shows that permafrost loss due to a rapidly warming Alaska is leading to significant changes in the freshwater chemistry and hydrology of Alaska’s Yukon River Basin with potential global climate implications. Such permafrost degradation is already fundamentally transforming the way that high-latitude, Northern Hemisphere ecosystems function. Warming air temperature is predicted to change water temperature and water column mixing in Oregon’s Crater Lake over the next several decades, potentially impacting the clarity and health of the iconic lake, according to a U.S. Geological Survey report released today. Using statistically modeled maps drawn from satellite data and other sources, U.S. Geological Survey scientists have projected that the near-surface permafrost that presently underlies 38 percent of boreal and arctic Alaska would be reduced by 16 to 24 percent by the end of the 21st century under widely accepted climate scenarios. ANCHORAGE, Alaska — A new scientific study predicts that some of Alaska’s mammal species will respond to future climate warming by concentrating in northern areas such as the Arctic National Wildlife Refuge and the National Petroleum Reserve of Alaska. If true, for many species, this would be a significant northward shift into tundra habitats where they are currently absent. Weaving concepts of ecology and climatology, recent interdisciplinary research by USGS and several university partners reveals how large-scale climate variability appears to connect boom-and-bust cycles in the seed production of the boreal (northern conifer) forests of Canada to massive, irregular movements of boreal birds. A new scientific synthesis suggests a gradual, prolonged release of greenhouse gases from permafrost soils in Arctic and sub-Arctic regions, which may afford society more time to adapt to environmental changes, say scientists in a paper published in Nature today. The latest edition of the National Land Cover Dataset (NLCD 2011) for Alaska is now publicly available. DENVER, Colo. — A pioneering airborne electromagnetic survey in the Yukon Flats near Fort Yukon, Alaska, by the U.S. Geological Survey has yielded unprecedented images of the presence and absence of permafrost to depths of roughly 328 feet. Rainbow Glacier perimeter: 1966, 1998, 2005, 2015. This image shows the perimeter of Rainbow Glacier in Glacier National Park: 1966, 1998, 2005, 2015. Heading out to take water chemistry samples for a study on permafrost in the Yukon River Basin. The study examined the chemical and hydrological changes occurring in the basin due to permafrost loss. Jay Hootch, former employee of Yupitt of Andreafski, drills to take winter chemistry samples to be used in a permafrost loss study in the Yukon River Basin. Allen Bondurant measuring the depth to permafrost along a thermokarst lake shore. -- are American pikas harbingers of changing conditions? The white colored rock (approximately 100ft high) shows the drop in the water level of Lake Mead as a result of the ongoing 10-year drought along the Colorado River. PubTalk 3/2010 — Changing Times-- A Changing Planet!